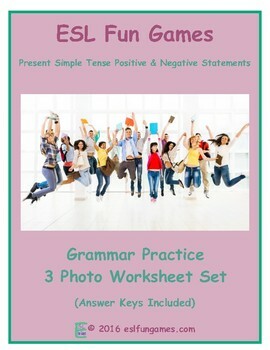 This is a set of 3 ESL worksheets to practice Present Simple Tense Positive and Negative Statements. Students will use the photos and written prompts to complete sentences about the target language. These worksheets are great for extra classroom practice, homework assignments or quizzes (answer keys are included in all worksheet sets). Be sure to look at all of our worksheet sets and games for more ESL grammar and vocabulary practice.